What’s the secret to a good news story? An Eye-catching Image – like the one above! The question is now, how good are you at working out what’s really going on when you read a hyped-up headline? Your challenge is to read the headline (below) from the Daily Mail reporting a suprising scientific discovery and then try to decide how much of it you should believe. In experiments with mice, Dr James Olson, a biologist at Washington University, identified a gene which goes by the name of neuroD2. In the mice this gene seemed to control the release of a brain chemical in the part of the brain that deals with fear. When this gene was tampered with, it seemed to change the way the mice remembered frightening situations. In one experiment, a group of mice were exposed to a loud sound followed by a brief electric shock from the floor. 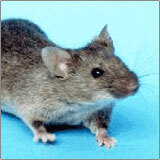 Some of the mice were ‘knock-out’ mice meaning that their neuroD2 gene had been altered. When the sound was repeated a day later, the normal mice froze in fear but the ‘knock-out’ mice with the tampered genes barely reacted. The scientists explain that this was because the normal mice were remembering with fear that after a loud sound comes a nasty shock, while the ‘knock out’ mice carried on as usual. Perhaps this finding could help to explain why some people are more wary of danger than others. 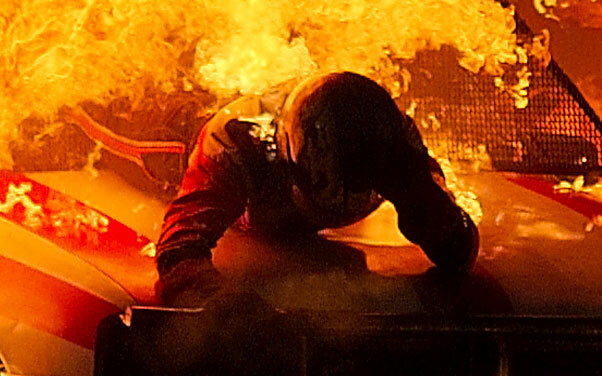 Perhaps some people are better at remembering the painful consequences that followed the last time they took a risk – making them more alert and nervous when a similar situation arises. The Daily Mail said that scientists have discovered something about human dare-devil behaviour, but this study was with mice. Does that matter? 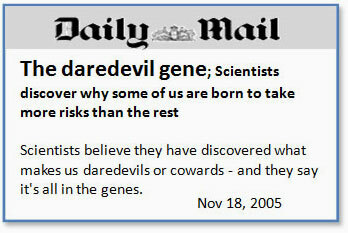 The Daily Mail said that Daredevil behaviour is ALL in the genes – so your destiny is determined before you are even born. Do you agree that this is what the experiments tell us? It’s a good story but how true is it? The headline in the Daily Mail is not a direct lie but it falsely suggests that scientists are saying that your genes are the reason why you do or you don’t choose to take risks. The bigger picture (which is missing from the story) is that people are not slaves to their genetic programming. The bottom line is if you choose to leap into danger and break three ribs as a result, you have only yourself to blame.